"Everyone Has A Story…..Your City Too!" I live in Edlibach, part of Kanton Zug in Switzerland. Where do you live? What city do you live in? Who are your neighbors? Who are those around you in your community? ….in your workplace? …where you play sports, shop, or enjoy your hobbies? We are all surrounded by people! The question is, are we for them……or against them? A few months ago, I was abroad and met with a pastor and friend, Adaumir, who also has a day job and who also planted a church about 6 years ago. We both realized, since the first time we met more that a year ago, that we have a lot in common. In particular, we both have an intercultural marriage, live in a German speaking country, are church planters, have passion for Jesus and passion for others to know Jesus and experience hope in life. In addition to our wonderful wives, we also have 3 kids each and again, in both cases, we have 2 older kids and a baby girl toddler. I was sharing that I believe that for my family of five, living in Switzerland has actually been healthy for our family unit, keeping us close in relationship and life conversations with our kids. Since we speak English at home and the rest of life outside our doors is Swiss culture and German language, I stated that sometimes I feel like it’s kind of like, “our family against the world around us”, but meant it in a good way, in that it keeps us close as a family unit. Adaumir agreed that they too have a close family unit, mixing their Brazilian/German/USA culture at home, BUT he wisely twisted my sentence by changing one word………and it made all the difference. He said that he prefers to say that he feels it is “his family FOR the world around him….not against it”! I’ve restated my version every since; yes, I believe it is my family, our little family of five, in Edlibach, Switzerland, FOR OUR WORLD AROUND US! I believe it is our church too, FOR our city of Zug around us! I believe that Living and Giving our faith, hope and love in Jesus does make a difference and is worth it! How about you, in your neighborhood and city? Each of us make a difference, one day and one heart at a time! Speaking (writing actually) of my city of Zug, I was blessed to experience something very special this past Sunday night with my wife Tanya. Once again, we were able to catch a glimpse of God showing a bit of His glory, and as usual, He’s always way ahead of us. 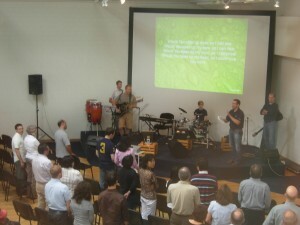 Our church LIFT has begun to share our facility on Sunday nights with ICF-Zug (International Christian Fellowship Zug) and on Sunday, ICF-Zug had its kick off celebration service at “the LIFT-Church” (as they call it). LIFT meets in the mornings and ICF on Sunday nights. During their announcements, they noted that their “after party” will continue at Pickwick’s, the local English speaking pub……even though ICF-Zug is a Swiss-German speaking church. Driving home that night, Tanya reminded me of some really amazing “Kingdom connecting dots” (thus my yellow highlighting above) that were part of my original church planting seminary project from back in 2002, long before LIFT or ICF Zug existed……although Pickwick’s has been around Zug for a long time! Way back in 2002, for that church planting project, that was only a project at the time, I included mention of Pickwick’s as a place where English speakers can connect and I also mentioned how ICF in Zurich was growing as a relevant church in Zurich (and also mentioned our friends across town as Stami as well!) and how these connections could be something God could develop and allow us to use here in the Zug area. So, on this past Sunday, not only did the manager of Pickwick’s, whose family now attends LIFT, come to LIFT’s morning service, but the 5 year old church plant of ICF-Zug also met in the same place as LIFT………..and to think that God “caused” these real life connections to happen in this city in an even more complete way than I wrote about way back in 2002 … that is something that is way beyond me!!!!! Have a wonderful week and I encourage you to pray and connect with your city and those around your realm of influence……in living and giving your faith away! Tanya and I are off to Dusseldorf today for a Mosaic event called “Tribus”, with numerous other churches and church planters across Europe. I’m even having an opportunity the share a word about “GO” during the breakout sessions www.tribusmosaic.org/the-team. PS: Below are words to a wonderful song about God and “your” city….mine too! This entry was posted in 2010, Encouragement, GO!, Live it and Give it!, Ministry. Bookmark the permalink. A couple of Sundays back, my family and I were able to attend a really special church celebration. The nearby International Church of Lucerne (ICL) celebrated 30 years of existance and for such an occasion, they really created a special weekend event and had a Sunday worship service that was indeed memorable for the “story” (past & present) of their church. (Many of you know that our family has the Colorado connection with the Post family who formerly pastored that church). It’s not every day that 30 years can be celebrated and in this case, they reunited ALL the former pastors and wives together for the weekend with many former families and friends who previously lived in Lucerne returning for the reunion. At Sunday’s service, during the “preaching time”, one after another these 5 of 6 men of faith, briefly shared a great Word from the Lord, taking a moment of prayer for the one of them, who has already gone on to be with the Lord. I’ve got to admit, it was one of the most special sermons I’ve heard, and I believe for each of them, it must have been beyond touching. Each of these men served the Lord at this church from 2 years to several years over the course of 30 years, all having spent time on that same stage preaching in that building, to various hearts and souls of people over the years, however on this particular morning, it was as if all of that history stood still in the present. I can only imagine the emotions, feeling and flashbacks they must have had, especially those who stood there long ago, in seeing a full crowd in front of them, while remembering the various families and faces from years earlier. What was exceptionally fitting in my opinion, was how the current pastor, Reagan Wilson, started off the Sunday morning worship service with a clear tribute to the Lord of lords and King of kings for such a celebration, Jesus Christ! To God Be the Glory, was the theme of 30 years celebration and Pastor Reagon nicely reminded everyone that although it’s great to look back at how the church has grown over the decades, the celebration, however, isn’t just about the church, or the people involved in the years, nor what people have done, but what GOD has down. So yes, celebrate and enjoy each other and the time together, but of course, first and foremost celebrate what God has done! This was a great start to a great worship service. May the Lord continue to bless this church in their continued story of living and giving the Gospel message into the future! BY THE WAY……… last Sunday was LIFT’s 6th birthday. Not quite 30 years yet, but it was exactly six years ago on the 5th of September, 2004, that 13 people (8 adults and 5 kids) gathered together in a small living room for the very first LIFT NIGHT! What a beautiful story the Lord has been writing and continues to write through our church as well! ALL GLORY TO GOD!!!! ………the journey and journeys continue for ICL and LIFT! Why not take a moment and pray for ICL, LIFT, their families, their ministries and their cities (as well as your home church and city too) and may the Lord continue to bless His Kingdom in these places and across all the nations as we, the Followers of Jesus, continue to “Live our faith and Give it away”….near and far! This entry was posted in 2010, Life, Live it and Give it!, Ministry. Bookmark the permalink. Everyone has a story….and a dance! ACT 1: “ALAN”- I met Alan last year and have admired his faith in putting his life on the line for the Kingdom in how he is GO-ing with God on mission, very much in complete faith. Alan’s is a dancer, a choreographer and a pastor hearted guy who left his job, his home church, basically his overall comfortable “normal life” in Los Angeles to GO and serve God alongside a church plant in Germany. I love the adventure and heart in this guy, even if I think he’s crazy…of course in the best sense of the word. At home, part of his ministry to the Lord from his talents and passion was that of serving with the dance ministry at his home church in LA. But his home church is truly unique in that they have an amazing extensive dance and musical ministry since many from the congregation are professionals who perform in dance, musicals and various productions in Hollywood, LA and elsewhere. Really cool stuff actually, and not something that most churches have access to with such talents in their congregations. And yet, as comfortable and cool as that may have seemed, Alan was called to “GO” and give of himself elsewhere, in a country called Germany, after his heart was touched during a short term mission there. Today, Alan isn’t working with numerous professionals and a large scale structured ministry team, but with local German speaking people who are learning dance (many for their first time) and how to use it as a form or worship and even outreach. Today, Alan is has a place to call “home” while living in an apartment with some roommates and eating food every day which seems normal. But, again that is today, but when this man of faith left his comfortable life in LA several months ago to serve the Lord it was WITHOUT PRE-FINANCIAL SUPPORT and NO GUARATEES OF IT! That’s NOT normal, and totally something I admire in Alan and his story! It hasn’t been easy and still a true adventure of faith, but God has been faithful and along the way has provided Alan’s basic needs every step of the way! Obviously there is much, much more as I didn’t even bring up like the fact that he doesn’t speak German, although the Lord has provided lessons since his arrival as well, but yes, Alan has danced his GO-ing feet for the Lord in special fashion. May the Lord continue to touch hearts through this faithful servant and Follower of Jesus. ACT 2: “GLEAM JOEL”- I’ll spare you the lengthy e-mail. Joel’s story can be found here: www.stillstandingthemovement.com. By the way, he’s got a musical/concert in Cham on May 21st and 28th with ticket information also on the link. I met Joel about 5 years ago shortly after we started planting LIFT as he was starting a “Hip Hop church plant” west of Zurich. Derek Webster was around at the time and helping Joel get connected with a German speaking Swiss church to be somewhat of the “support church” to Joel’s vision. It’s even funny now again trying to imagine this conservative Swiss (German speaking) church with many mature (a nice way of saying old) congregants coming alongside a foreigner with poor German, but incredibly flowing and rhyming English from Africa who’s vision was to use Hip Hop to reach the younger generation. One of the most profound things I ever heard since coming to Switzerland was Derek sharing at the time about one of these “old Swiss conservative Christian men” who was totally skeptical and against the whole idea of a Hip Hop Church and their church being associated with it. This old man, skeptical as he was, attended a “Hip Hop church service” which was basically a Hip Hop concert with a sermon, and that night afterwards deciding that HE TOO LIKED HIP HOP MUSIC IF THAT’S WHAT IT TAKES TO SHARE THE GOSPLE WITH YOUNGSTERS! About 100 had attended that night and he realized the power of using contemporary means to share Jesus in a relevant and effective manner. Soon after, this old man was that Swiss church’s strongest supporter in gaining others to support this young church plant! That’s a cool story all in itself! So there you have it, my TRIO OF DANCE of insight and gratitude to others in serving the Kingdom of God; using dance and faith as worship to God and a way of sharing Him with others…….in living and giving their faith away! Everyone has a story…and a name! This is my second re-write of what your about to read below. As a preface, those that know me, I’m NOT a doom and gloom kind of guy- that’s done all too well by the news and media today in “selling” stories that need statistics and numbers to back them up. As I mentioned in my last writing, this year I’m simply trying to look deeper into the stories of individual people, especially the ones that I find sitting in front of me, wherever that might be. Sometimes, it’s a continuation of that meeting even if from long ago….their story is still being written, just like yours and mine. So often today, we hear or read or watch the news regarding stories, often with massive statistics and numbers. Stories of war ravaged nations, stories of natural catastrophes, stories of helpful entities and stories of billions and billions of currencies. The numbers can sometimes be so large that we can’t grasp the point. In one city on one side of the planet 60 die in a bombing at a mosque during prayer, but that story is lost to more than 100,000 dead from a catastrophe on the other side of the planet. We hear about children dying every few seconds somewhere on the planet due to starvation or lack of water, numbering hundreds of thousands in months and/or millions in a year. Our hearts get grabbed and we so want to help or do something significant, but feel so small and inadequate. The truth is that many are being helped in many ways by various churches or denominations (often yours or mine in ways you may not realize), humanity organizations, NGO’s (non governmental organization), governments, politicians, rock stars, movies stars and even billionaires like Bill Gates. The truth is there are still even more not getting help. GRASPING THE POINT: Behind the massive statistics and numbers is “a story” (singular) of “an individual” who has “a name”. One has to go deeper to the individual story behind the larger stories, still never capable to ever really grasp the big story (although God is big enough and does that!) I believe the reality is we too often miss the point of one single person who has a name because we’re overloaded with the data, facts, figures and numbers and missed the individual face behind it…..unless we know that face or that name personally, or connected personally (and I’m definitely not talking Facebook here). The paragraph above has non specific stories but hypothetically looking deeper, we read right over the story of an Islamic mother who’s life will never be the same after burying her son tomorrow who was the Islamic prayer leader killed in the bombing by one of his own. There’s 59 other mothers mourning over their lost one too, not just for the guy leading the prayer. There is a hungry man desperately trying to feed his family today, but carrying the loss that it was to late for his 3rd born son who didn’t make it past yesterday. This man has a name, and he definitely knows the name of his children, especially the name of his 3rd born in which he wrote it on the makeshift tombstone this morning. (Again, this is hypothetically written, but even writing it, I’m getting the point all too well myself). On the positive side, how many amazing individuals make a difference one face at a time, one bowl of food at a time, to act of compassion at a time. Above only organizations are mentioned except for Bill Gates but what about the names of those that spend a lifetime living giving to another in a 3rd world country when they grew up in a western home full of convenience? They have a name too? Their family they left behind for most of their life knows it and so does the family they serve in their 3rd “home”land that is truly their 1st world. What about those that do get a chance to give in an offering or go on a short term trip? They have a name, and so do the people they meet along their journey. We can’t grasp the real story (singular), because we too often only get the overload of too many stories (very plural) with too many names and faces. I can only praise and thank God that “He is God….and I am not!” He is God and He knows every story, every face, ever detail and every hair on every head (shaven, full of lice, disease, expensive perfumed shampoo, colored, gray…yes I have a few myself)! He grasps it and He cares! “Before I shaped you in the womb, I knew all about you. Before you saw the light of day, I had holy plans for you” (Jeremiah 1:5 The Message) That makes all the difference for all of us when we think we can’t make a difference, in our own story and in the story of another (singular), or even others (plural). In closing, I’ll share something that’s not hypothetical, but a real person, with a real story and a real name. His name is Paul, he’s a pastor. I last saw him about 10 years ago with his 9 year old son, whose name is Silas. At the time, Paul was a fellow pastor serving alongside my oldest brother Steve. Tanya was pregnant with our 2nd child and when we met Paul and heard him call to his 9 year old Silas running around. The “name” grabbed our hearts and the day our child was born and we learned he was a boy, we called him Silas. Today, my 9 year old son named Silas is at school in Edlibach, Switzerland. Today, Paul and his son Silas are sitting in a jail in Haiti. Paul and Silas are one of the 10 Americans currently being charged with child trafficking as reported in new headlines all over the world. Paul and Silas have a name, a face and a story. Yes, knowing the names and faces of those in the stories being reported around the world makes a difference. Yes, knowing that God knows the stories and faces of the stories being reported around the world makes a difference. In 2010, I’m seeking to learn through other’s stories. As this year continues, I’m a bit nervous in looking too deep into others stories…….but I believe the journey will be “beyond what words can express”, and I believe………. that’s enough words right there. PS- I don’t know the stories each of other “8 Americans” in Haiti, nor the rest of the 8 billion on the planet, but I can pray for those I don’t even know as well, because God knows them and God cares! This entry was posted in 2010, Life, Ministry. Bookmark the permalink. As announced this past Sunday at LIFT by the Servants Leaders (and I), there is a new era for LIFT in the months ahead in going and growing forward in faith with the Lord……..just as LIFT has done from the beginning. On behalf of my family and our church I want to thank the Servant Leaders for their wonderful hearts, encouragement, insight, wisdom and prayers during our discussions over the past months in preparation for the year ahead of 2010 and beyond! The following is the announcement that was shared to LIFT and over the next weeks, I intend to continue the conversation together via the LIFT updates! Oh yes guys…..the journey of faith and the journey of LIFT continues and I look forward to seeing the Lord continue His blessings upon LIFT beyond our expectations! Beginning in January 2010, the Best family, after 5 years of “tentmaking” missionary work at LIFT, is taking a “sabbatical” for 2010 and turning over the active LIFT church leadership to LIFT’s Servant Leaders and LIFT. Although it is often that a missionary family takes a furlough year after 4 or 5 years in the field, it usually means the family returns to their homeland and home church. In this case, however, the Best’s (2nd) homeland is Switzerland and their “home church” is LIFT, thus we’ll all be seeing them around quite a bit. For their family, 2010 will also be a year of pursuing passions that God has placed within them regarding a broader Kingdom vision of connecting other church plants from around Switzerland and Europe for mutual encouragement and synergies. So folks, I first want to underline the part about “we’ll all be seeing them (the Best’s) around quite a bit” at LIFT. Aside of taking several weeks away from January to the end of February, we are so thankful that for the rest of the year we have a home church within our (2nd) homeland to be refreshed by and blessed to belong to such a wonderful body of believers and friends. As we are turning over the daily active leadership of LIFT and also the various ministries both Tanya and I are involved with, we totally look forward to enjoying the freed up time to be able to follow the Lord’s leading and pursue passions the Lord has placed within us, all the while doing more things as a family of five as well, many of which will also include being with families of LIFT that we just haven’t had the time to fellowship with. Part of our DNA at LIFT is “Serving Together- ALL of us!”. It’s been mentioned every single week for the last 5 years since LIFT began……you know, right after “The Bible is our source, living our faith and giving it away and being counter culturally friendly”. Although Tanya and I are involved with numerous ministries, LIFT isn’t Corey’s church, nor is it Ken or Bedros’ church, but LIFT is (put your name here)’s church…..or actually LIFT is all us together as part of Jesus’ church! Just as each of us has one body with many members, and these members do not all have the same function, 5 so in Christ we who are many form one body, and each member belongs to all the others. 6 We have different gifts, according to the grace given us. If a man’s gift is prophesying, let him use it in proportion to his faith. 7 If it is serving, let him serve; if it is teaching, let him teach; 8 if it is encouraging, let him encourage; if it is contributing to the needs of others, let him give generously; if it is leadership, let him govern diligently; if it is showing mercy, let him do it cheerfully. 1) Pray for our church LIFT and for one another! 2) Talk about it, meaning don’t hesitate to ask me, or the Servant Leaders what it means that the Best’s are turning over the leadership to LIFT, or what broader Kingdom vision means, or any other questions you may have. 3) Consider your calling and what ministry you can serve in as a stronger part of the BODY! In closing, Tanya shared this verse with me a couple days ago in how during this week in particular and the months ahead, it is a great Word of encouragement in faith in the One who endured the cross for us! Therefore, since we are surrounded by such a great cloud of witnesses, let us throw off everything that hinders and the sin that so easily entangles, and let us run with perseverance the race marked out for us. 2Let us fix our eyes on Jesus, the author and perfecter of our faith, who for the joy set before him endured the cross, scorning its shame, and sat down at the right hand of the throne of God. Consider him who endured such opposition from sinful men, so that you will not grow weary and lose heart. This entry was posted in 2009, Encouragement, Ministry, Thanksgiving. Bookmark the permalink. Live it and Give it!